Spring is just around the corner and that means, shopping spree! Really, why? Well, I know every woman wants to update her closet with wardrobe essentials for spring, but they want to do it at a reasonable price. I’m so glad ThredUP offered me a chance to try out their service because I am completely impressed with how much you can get through this online consignment. A hundred dollars here goes a long way and you get amazing finds. I’m talking quality designer pieces for a price that you can actually afford! Today I’m sharing with you my wardrobe cheat sheet for spring essentials in hopes to inspire you to get spring shopping on your mind. ThredUP has a lot of gently used clothing, but occasionally you can find gems like my Little White Dress that has never been worn. I got this brand new Alice and Olivia dress (seriously, the tags were still attached) for $76. Retail designer price for this is $297, but it sold for $101 through ThredUP and with a 40% first-time discount (code: 40NP) I got an amazing deal on it! I’ve never been able to get a designer dress that cheap! Then there’s this Milly bag, from one of my favorite designers with such a bright and unique style. 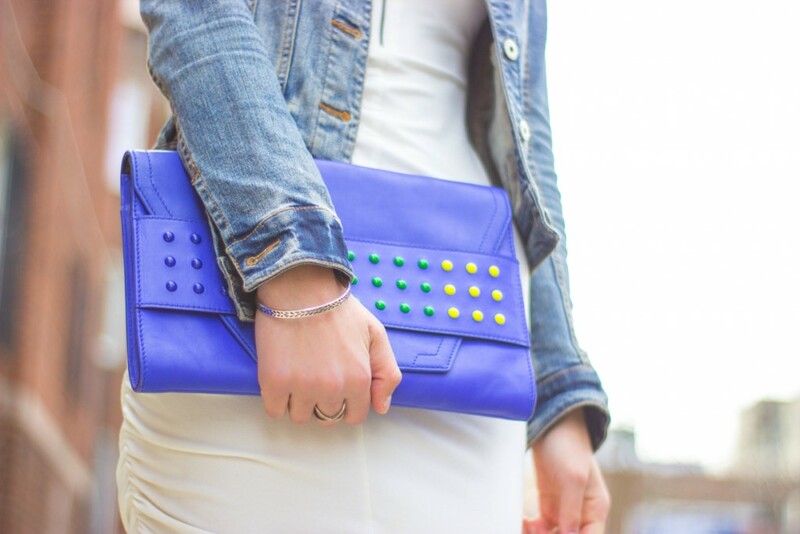 When I saw this colorful clutch I knew it was a spring must have. To me, spring means bright and colorful so adding a bright colored bag to your wardrobe will instantly brighten it up. This Milly clutch retails at $245, sells for $89 but I got it for only $67 at ThredUP with that one time discount again. An amazing prize for such a quality find. Look for things that you can layer. With the spring weather coming, the sun starts to peek out, but there may also be a cool breeze blowing. This is always my favorite part about spring! A blazer, denim jacket, or scarf are definitely my go tos for keeping me warm! Look for a color or pattern that make you happy. Look for crisp spring whites. Spring reminds me of new beginnings and that means fresh white is coming back! OK, so I’ve been wearing them all winter, but it’s definitely still on trend this season. Choosing to go for a little white dress, white heels, or a white pencil skirt can definitely be ways to add fresh white inspiration to your outfits. I’m all about mixing things up and finding new ways to incorporate such a fresh shade! Hopefully, you find some amazing pieces to add to your spring wardrobe, and remember, you can get a 40% off credit first time you buy through ThredUP. Use code 40NP and you’ll get such a good deal! I’d love to hear. What are your must-haves for spring? *Although some of these items were gifted from ThredUP, it is my promise to always give an honest review! I would never recommend something I didn’t love! That’s awesome Lindsay! Hope you got some great deals too! Thank you so much! I’m always a bit weary about consignment shops. But these finds look so nice, so I’ll definitely have to check it out. And I’m going to have to get a white dress for spring! You look beautiful as always, Molly. Rocking it! You must get a white dress for spring! Definitely check out ThredUP. Their designer section is my favorite! I can’t believe I found such amazing treasures! Thanks for the love! Thank you! I love the combination of a LWD and jean jacket! gosh that dress is beautiful!! I have never heard of ThredUP. Will have to check them out. What I absolutely love and thankful for in this post is not just you sharing this super pretty look, Molly. It’s the tips along with the outfit and your advice! Thanks for putting this post together, girlie! Definitely some great scores from ThreadUp…that dress looks like it was made for you! I love spring fashion and all your tips for updating the wardrobe are great. Thank you Shannon! I love being able to find a good deal and I can’t believe this dress still had the tags on it! Glad you loved my tips too! LOVE! I got to work with ThredUp for my post today, too and found some awesome buys on their site to change up my spring wardrobe! That’s awesome Chelsie! Isn’t ThredUP so wonderful?! Another beautiful outfit! I’ll have to look into ThredUP! Thanks for sharing! Thank you! LOL Ela! He’s not my Instagram husband! Just a friend’s who was kind to let me borrow for a shoot haha. Glad you approve of the photos and the outfit! I am too! LWD all the way for spring! Thanks for the compliments! ThreadUp sounds so interesting! I love white on you! Thank you Courtney! White is essential for spring! Hope you check ThredUP out! They have awesome designer finds for ridiculously good prices! I am drooling over that dress! I adore Alice & Olivia, and that price for a NEW dress is insane! You sold me on ThredUp on that alone. Gorgeous look Molly! Thanks Angie! I was a little skeptical to try thredUP at first, but then I found this gem and was like OK, they must more treasures if you look carefully! I have been meaning to give ThredUP a try and after reading your post I definitely am going to! Love the color of that clutch, and as always you rock a white anything, haha! My must haves for spring is plenty of pastels and florals. I love pastels and florals for spring too, but I think my fall back is white of course. Haha! Hope you give ThredUP a try and find some amazing things! I was really impressed with my designer finds for awesome prices! Hi Molly! I just stumbled upon your blog and totally loving it. Hi Richa! Thanks for stopping by! You are so kind! So simple and chic! Can’t wait to try out ThredUp for great fashion finds! Thanks Kim! I hope you find some great fashion finds! Looking beautiful Molly! I’m a big fan of second hand shopping, it’s such a great way to rock designer items without splurging. The pieces you got are just perfect for spring! I agree! It makes designer wear more affordable for my budget! Definitely get more bang for my buck. Thank you for the compliments! Why must you be so fabulous! I just love everything thing you put on, Molly. Wow! What a huge compliment! Thanks for saying that! Awww Monika you make me smile! I hope you end up trying it and find something you love. I’d love to hear what you find when you do! Glad you like my tips too! Thank you! Scarves in the spring are the best! I hope spring comes soon for you! You look so gorgeous! I love your blog!! Thank you Jac! That is such a kind compliment! Have a great week girl! Victoria, you always know how to put a smile on my face! Sorry for the late reply! That dress is gorgeous! Love this look, it is so elegant! Thanks for the cheat sheet!! Glad you enjoyed it Shell! Much love to you! Thanks so much! 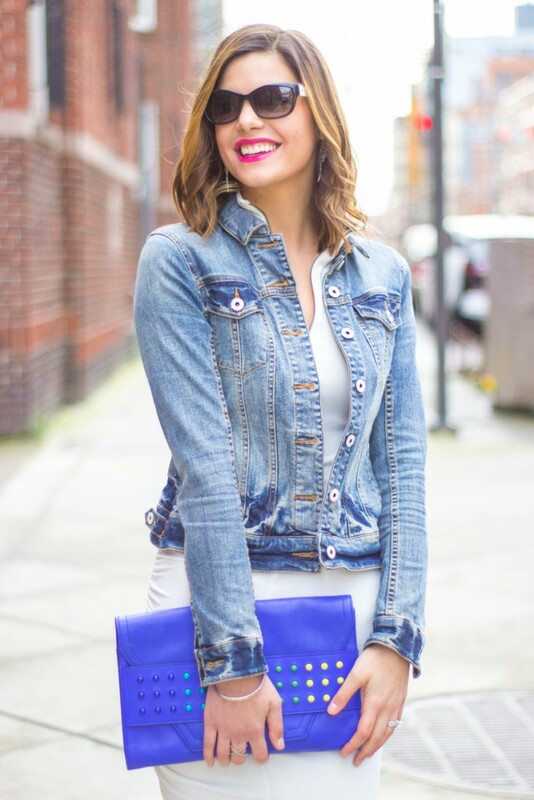 Styling a denim with white is one of my favorite combos! Great post Molly! I love your ThredUp finds. I’m a ThredUp junkie. Lol! Love the outfit! You look gorgeous and ready for spring. Thank you Asa! Do you use ThredUp a lot?! I haven’t tried selling anything but am curious about the process. Ah, that’s perfect! I will have to try it out soon then! Right?! Super amazing finds! So glad I found them! You look so beautiful in this blue jacket and your blue purse is so eye catching, I will recommend you to wear Black leather jacket it will surely make you look more cool then what you are wearing.